How Many Credit Checks Before Closing on a Home? Navigating the purchase of a home can be overwhelming for first-time buyers. Lenders require documentation of seemingly every detail of your life before granting a loan. And of course, they will require a credit check. A question many buyers have is whether a lender pulls your credit more than once during the purchase process. The answer is yes. Lenders pull borrowers’ credit in the beginning of the approval process, and then again just prior to closing. In the first phase of acquiring a loan, pre-qualification, you’ll self-report financial information. Lenders want to know details such as your credit score, social security number, marital status, history of your residence, employment and income, account balances, debt payments and balances, confirmation of any foreclosures or bankruptcies in the last seven years and sourcing of a down payment. This is only a portion of the total information needed for your mortgage application. Once you’re ready to get pre-approved for a loan, lenders will verify your financial information. During this phase, lenders require documentation to confirm the information in your application and pull your credit history for the first time. You may be required to submit a letter of explanation for each credit inquiry in recent years, such as opening a new credit card, and for any derogatory information in your history, like a missed payment. Once you find a home within budget and make an offer, additional or updated documentation may be required. Underwriters then analyze the risk of offering you a loan based on the information in your application, credit history and the property’s value. It can take time for your offer to be accepted, and for your loan to pass underwriting. During this period from the initial credit check to closing, new credit incidents may occur on your history. Many lenders pull borrowers’ credit a second time just prior to closing to verify your credit score remains the same, and therefore the risk to the lender hasn’t changed. If you were late on a payment and were sent to collections, it can affect your loan. Or, if you acquired any new loans or lines of credit and used those credit lines, your debt-to-income ratio would change, which can also affect your loan eligibility. If the second credit check results match the first, closing should occur on schedule. If the new report is lower or concerning to the lender, you could lose the loan. Alternatively, the lender may send your application back through underwriting for a second review. As a buyer, it’s important to be aware that most lenders run a final credit check before closing, so the home buying window is a time to prudently mind your credit. It’s true that changing jobs can affect your loan approval, but, like most mortgage-related questions, the devil is in the details. So long as you are moving from one position to one with equal or higher income, and you are able to provide documentation of your work and income history, any changes to your loan approval chances should be minimal. The most important thing for lenders and their underwriters is ensuring you can repay the loan, and the best indicators of that are your income and history of employment. Lenders want to know you have reliable, steady income that is ongoing, for at least the next three years. If you’re thinking about accepting a new job or recently moved positions, consider the ways it may hinder your mortgage acquisition. If your new job is within the same industry as are your last, and if the transition earns better pay, then lenders likely will not have a concern. Promotions are looked at favorably. Even lateral moves to stronger companies offering increased salary or improved benefits are sensible business decisions that shouldn’t impede loan acquisition. Your lender likely will want to ensure the longevity of your new role and confirm your new salary. Full-time positions with long-term contracts are ideal. Expect to work in your new role for at least 30-days before earning loan approval. Typically, you’ll need to provide your first pay stub from the new company and disclose your offer letter confirming your salary. Be prepared for lenders to omit commission earnings from your total salary since your commission is unproven in the new role, which could affect your total loan amount. Avoid transitioning to a job that doesn’t make financial sense, such as a lateral move for less pay, a change from full-time employee to contractor or a major industry change. Employment history showing frequent career moves could be a red flag for lenders that you may not be able to maintain steady income. Another red flag for lenders is an extended gap in employment history. Chances of acquiring a mortgage may be stronger if your period of unemployment was less than six months. However, some exemptions include military service members returning from deployment or full-time students transitioning into the workforce; these paths are viewed as forms of employment. How to get a home loan when relocating? If your new job requires you to move, you’ll need to solidify living arrangements before relocating. If you don’t mind renting in your new location for at least 30 days to provide lenders with your first pay stub, it’s likely the least stressful solution. Extended-stay hotels are popular options while familiarizing yourself with the surrounding community and local real estate market. On condition that you’re sticking to the same industry and the new role offers a financial or career advantage, the new job should not restrict quick loan acquisition in a new city. Alternatively, you could attempt purchasing and closing on a home in the new location before giving notice to your current job for a smooth, one-time move. If you’re moving fast, understand a purchase offer takes 30-45 days to close, on average. Lenders verify employment during loan application and then again just prior to closing, so be sure to maintain employment until the sale closes. If you’re a homeowner and need to sell while shopping for a new home, and possibly live in a rental simultaneously, finances can become demanding. Selling your current property before buying can provide cash from closing to help fund your down payment, which could boost your loan eligibility. But if you can afford carrying two mortgages for a period of time, you can purchase a home in the new location, move in directly and then work to sell the initial property remotely. Again, you’ll be limited to the speed of the purchase agreement or expect to disclose your new role to the lender. Can relocation packages help with home purchases? Often, companies offer relocation packages that range in coverage from paying for a moving service to a generous Guaranteed Buy Out (GBO). A GBO is when the company buys your home for an average appraisal value if it does not sell in a fair timeframe. Other relocation packages might help with closing costs of your home sale or pay the real estate commission fees. If you’re underwater on your home, your new employer might cover the loan difference at resale. Some relocation packages assist their new employees purchase a local home within a year of moving, they may buy down your interest rate or contribute to a down payment. Whether buying a house out of necessity or preference, acquiring a new job within the same industry for better pay likely won’t prevent loan approval, but it may slow the process down by a month. Leave it to a celebrity architect to live in a home that was just voted our 2017 House of the Year. Each week, we take you inside a unique space – from a shipping container converted into a tiny home to a magical treehouse that happened by accident. And at the end of each quarter, we ask you to vote on your favorite. Tens of thousands of you weighed in throughout the year, voting this wooded, waterside home your favorite of those featured on Porchlight. Even with its August debut, it quickly earned nearly 2,500 votes. 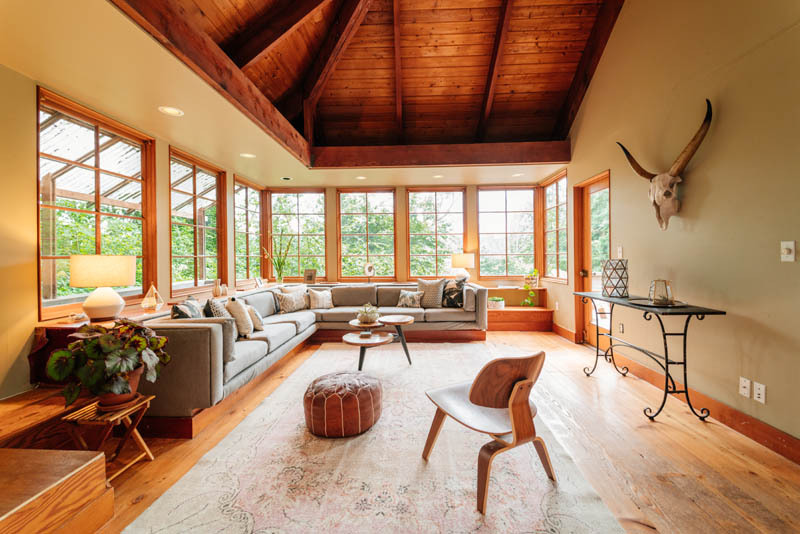 When we first wrote about the five-story home among the treetops, it belonged to Jason McLennan, a designer and environmentalist based on Bainbridge Island, just outside Seattle, WA. 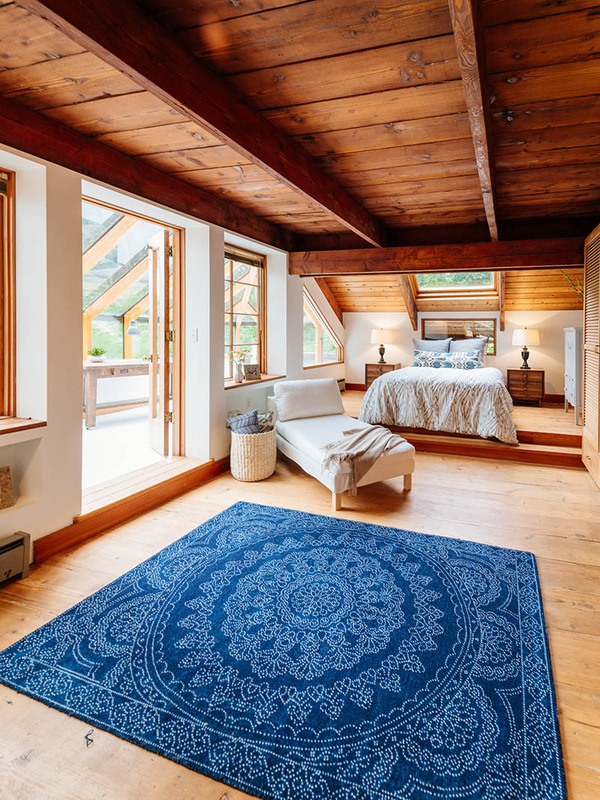 You loved McLennan’s 3-bedroom, 4-bathroom sanctuary with reclaimed wood, accents from a salvaged ship, and lush, green surroundings. 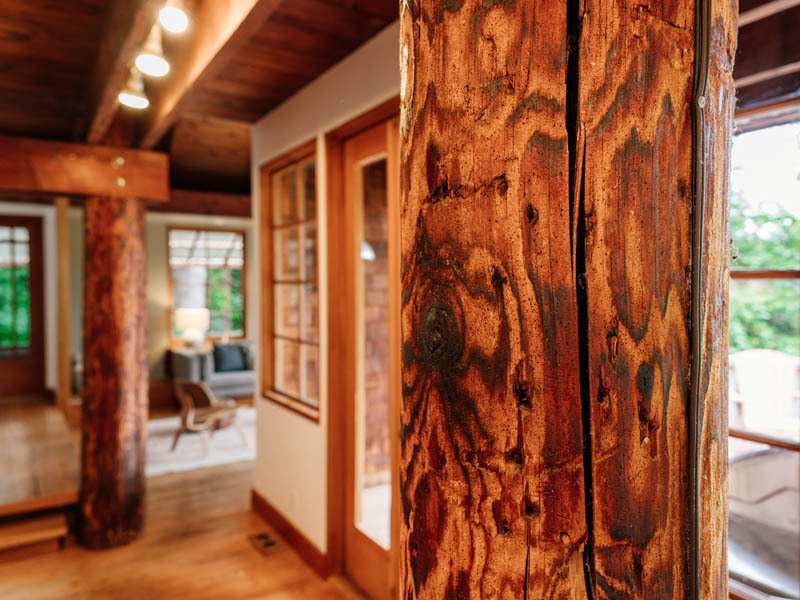 The house was built in 1978 by another architect, who salvaged four, immense wooden posts to anchor the living space. 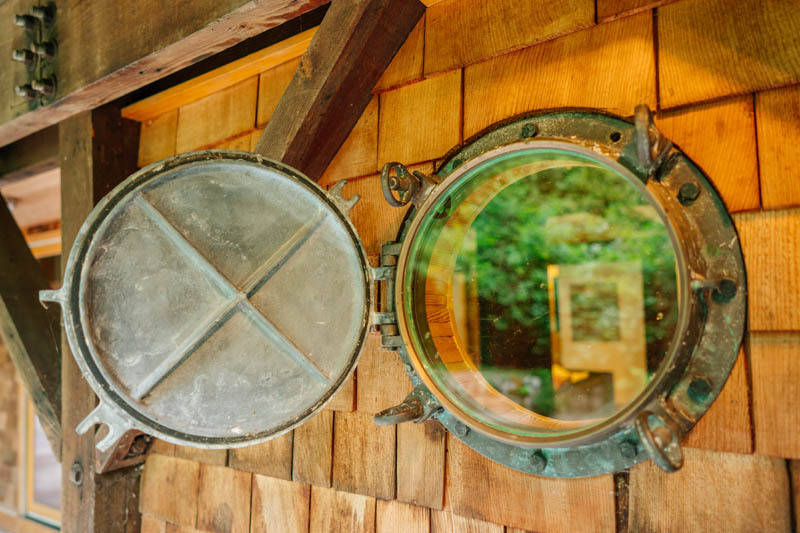 The builders rescued other touches from an old ship, in a nod to the local maritime industry. 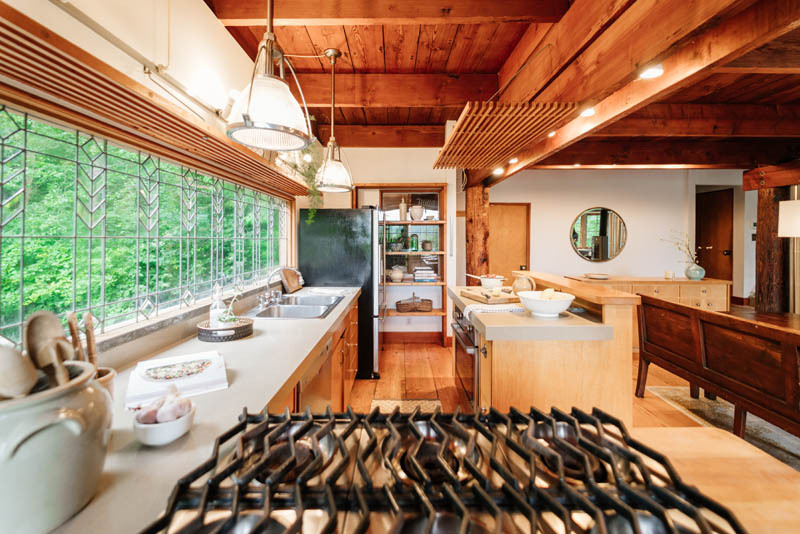 A 12-foot-long antique leaded glass window anchors the kitchen, while adjacent doors open up to a patio that offers views of Puget Sound. Every floor of the five-story home has vistas of passing ships. It’s part treehouse, part ship, some might say. The home stands in stark contrast to last year’s winning home, a 16,000-square-foot palace with a private ski bridge in Big Sky, MT. That 6-bedroom, 9-bathroom home boasted a full gym and movie theater. This year’s stunner sold over the summer for $875,000. Read more about the home in our original post here.